Yay my first post and thread. Centenery Park - just a big roundabout actually. Marriot - and that other tacky piece of crape, willhara. Surfers!!!! I could live with views like this. Looking back towards Brisbane - you can just see tower of terror! Just stuck out there - Suburban Office Building at Bundall. Open spaces and balconies forever. Some of Queenslands most expensive real estate down there!!! I think we know what this is. I've said it before and I'll say it again - Q1 looks amazing from the suburbs. Awesome pics!! I love Australian cities. Welcome to UP and like Allan said, awesome pics! I didn't know that Brisbane was that built up! I love that bridge. I didn't realize Brisbane had a signature span (guess the Sydney Harbour Bridge kinda outshines everything else on the continent). What's the bridge called. Sorry for taking so long to visit this section, but welcome to UP, JayT. I really enjoyed your tours. I have heard of Brisbane, but this is the first time that I have seen such a collection of photos from what looks to be a great city. I also like the Gold Coast part. Maybe I will get to visit one day. Gosh thanks everyone. Sorry for the 'post and run' but I have had quite a lot to do at uni of late and one forum is enough. I will endevour to visit more often. That Q1 building, despite how out of place it looks, is amazing! Firstly I can empathise with your University obligations as I study Architectural Technology @ TAFE, Ultimo Campus in Sydney. We have so much work including drafting in the traditional ways i.e. Draftings by both on paper and also on computer i.e. CAD. Also you are proving to be an invaluable contributor to this site. Make sure you will endeavor to visit this site more often and keep to be a regular updater. Brisbane really has some neat looking skyscrapers! What is the population of the city? 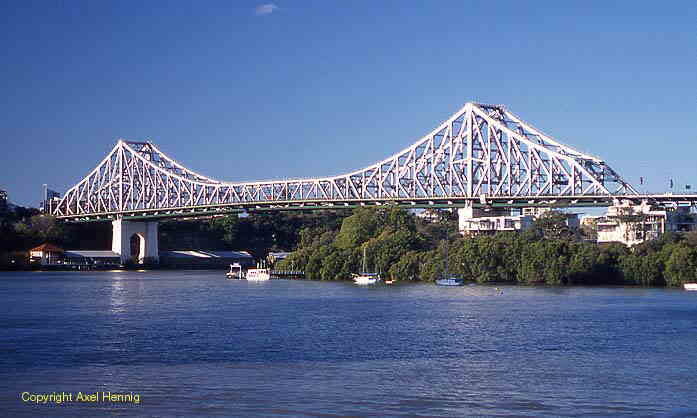 Well firstly, the largest bridge in Brisbane is known as The Story Bridge. It's the 3rd largest capital city in Australia (in the most north-eastern State of Queensland) fastly aproaching 2 million, including what we call "Greater Brisbane". Beautiful! Nice pics and welcome! So it would be like Miami I guess, or something like that. Thanks. Very Nice Pics! By the way every city should have a site as detailed as that one!